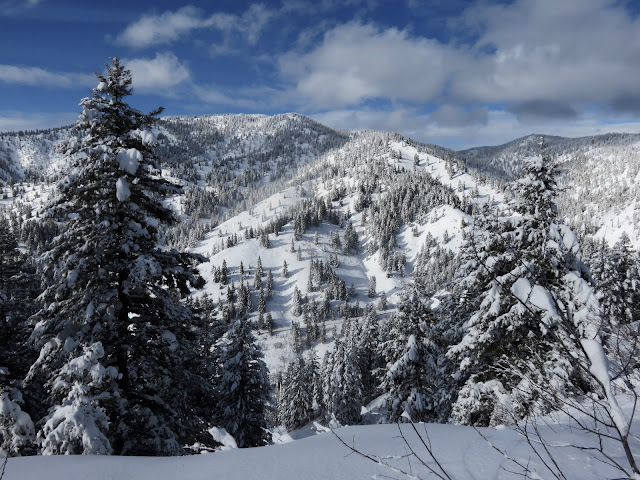 This Wednesday - January 18 through Thursday - January 19, another energetic storm precipitated from 30 to 40 cms of snow in the Boise Mountains. Idaho 21 from Idaho City to Mores Creek Summit was closed again this week from Thursday through Friday. Apparently, limited human and equipment resources are hampering Idaho Department of Transportation (IDT) to promptly reopen I21 after this winter significant snow precipitation events. These closures are negatively impacting winter recreation activities in the mountains above Idaho City. Snowmobile transiting I21 inside the closed section. 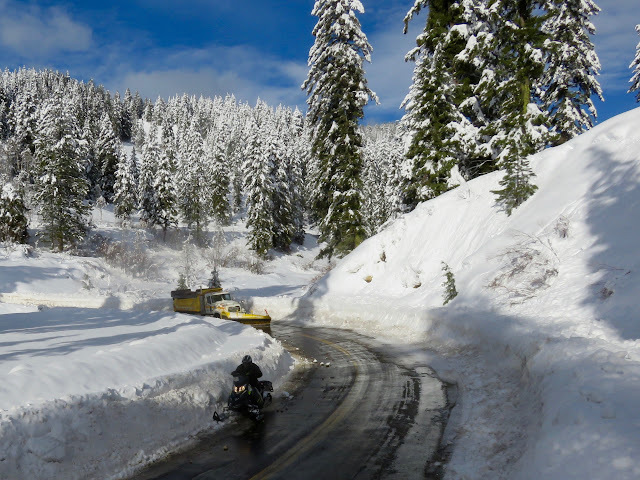 Recreation at Mores Creek Summit is currently a lower priority for IDT, and the focus is restoring vehicular traffic between Lowman and Idaho City, in order to provide access to Lowman residents to essential services. Perhaps, IDT should consider closing I21 road at Whoop Um Up Park N' Ski area to allow snowmobilers and skiers to access Pilot Peak recreation area. Another option is to close the road at Mores Creek Summit. A less ideal option is to close the road after the 12-mile creek pull-out area. Any of these three options are better than the current closing location at milepost 48, between Bad Bear and Hayfork campgrounds. The current road closure location is simply too low in elevation - 4900 feet. 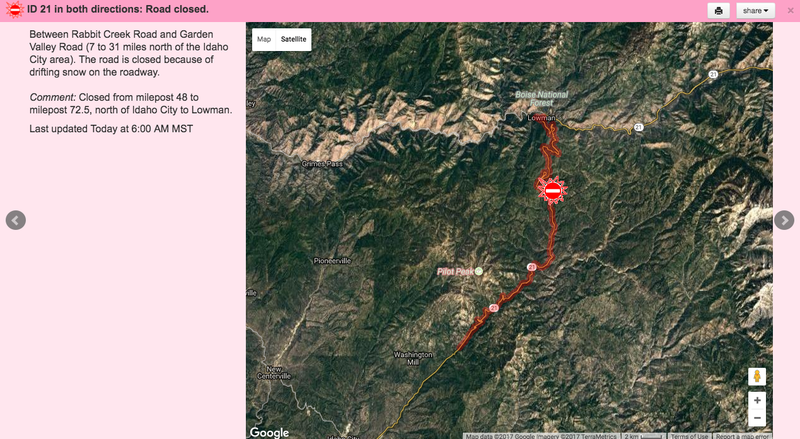 I21 current road closure location at 4900 feet, between Bad Bear and Hayfork campgrounds. Last Saturday we climbed to Freeman Peak from I-21 at milepost 48, the point at which the road was closed. 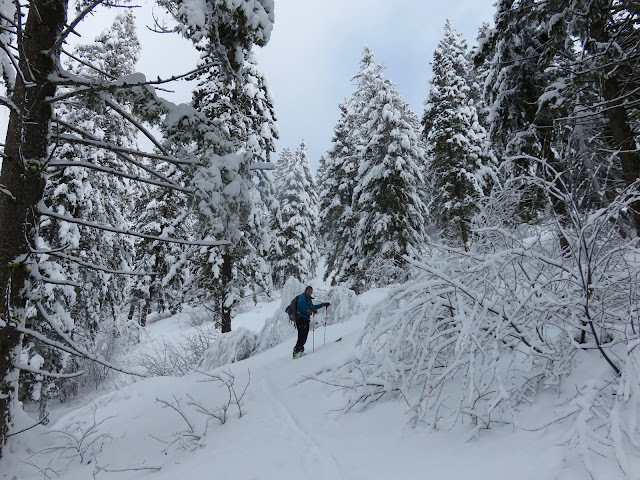 Check the blog post Great Skiing at Freeman during Idaho21 Closure. Today we skinned up via Sunset Peak's western ridge. The ridge gradually climbs to the north from Hayfork campground. We used the Hayfork campground bridge to cross Mores Creek. Somewhat brushy terrain above Hayfork Campground. The skiing was great above 5400 feet, with over 30 cm of soft powder. 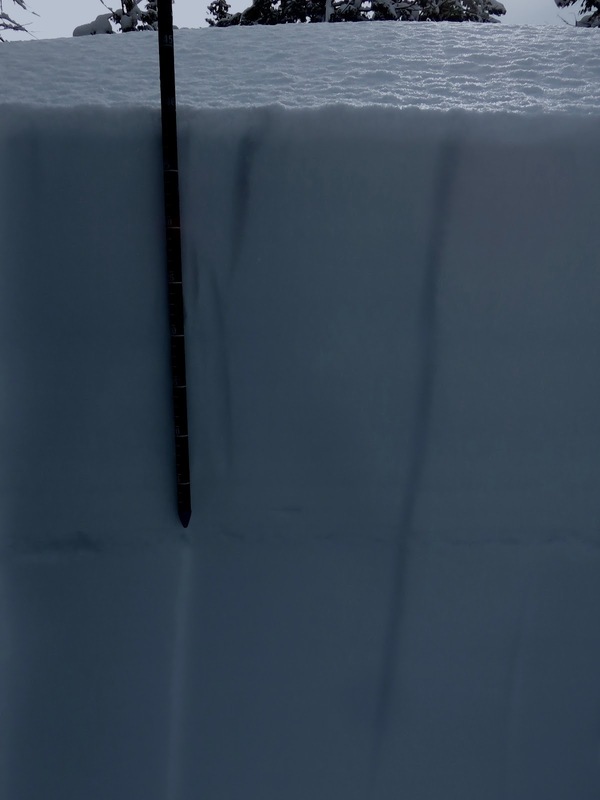 Below 5400 feet 10-15 cms of medium density snow covered a supportable rain crust layer. 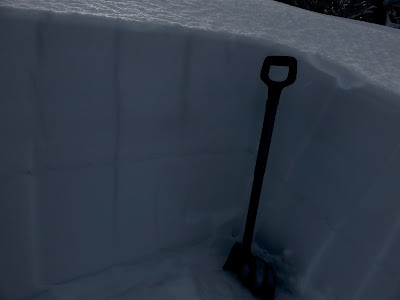 At 6200 feet we confirmed that last week surface hoar was preserved and buried under 40 cm of new snow. We triggered several whumpfs (e.g., snowpack collapses) between 5600 and 6400 feet. We did not observe surface crack. 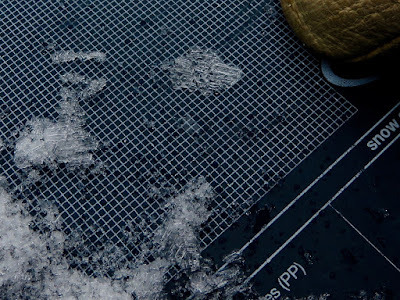 The next three pictures show the fragile surface hoar layer at the 40 cm depth. The last picture of this set shows the surface hoar crystals we harvested from the buried weak layer. Not surprisingly this layer showed a propensity to propagate failures. 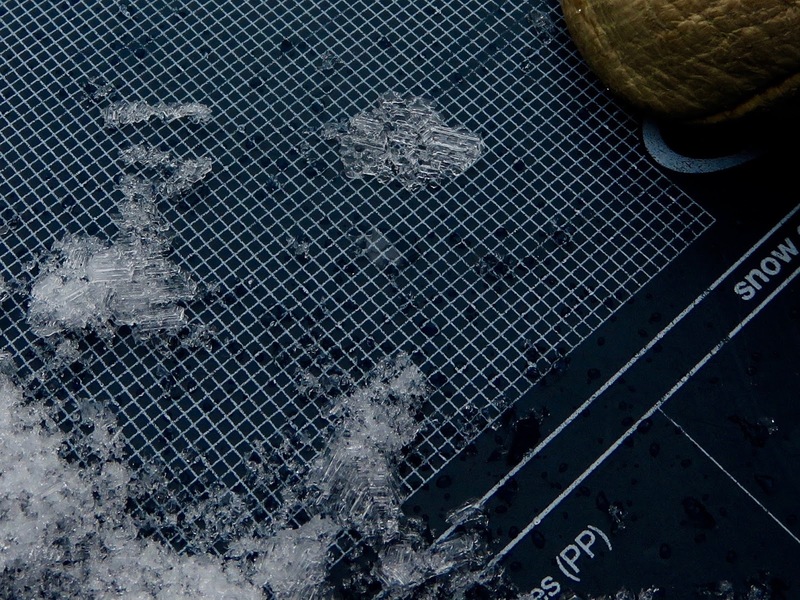 The large 5-10 mm surface hoar crystals (picture above) make the weak layer very fragile and reactive even under soft slab conditions. The next video shows how a shovel compression results in a sudden collapse failure in an extended column. Standard compression tests produced moderate fracture failures results - CTMQ1(SC). 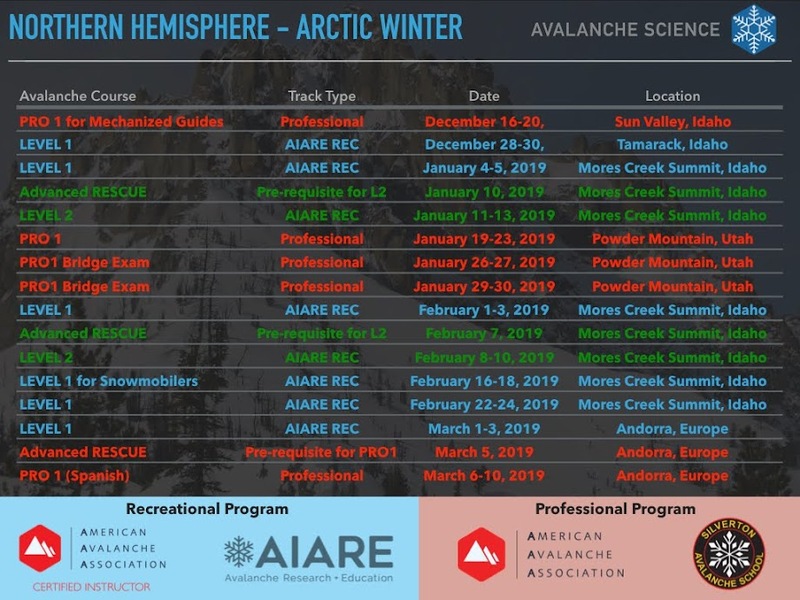 Moderate compression test results require that we evaluate skiing and travel terrain selection based on the premise of how the snowpack structure might change such that moderate results are instead easy results. Or what snowpack/weather/terrain changes are necessary to make the snowpack more reactive. For instance, the surface hoar instability is likely to worsen and become easier to trigger at slopes with buried surface hoar above a solar radiation crust, or location experiencing wind loading, or new snow precipitation, or rain, or warm temps. We did not observe surface signs of a "natural" slab avalanche cycle during the Wednesday-Thursday storm. That was unexpected. 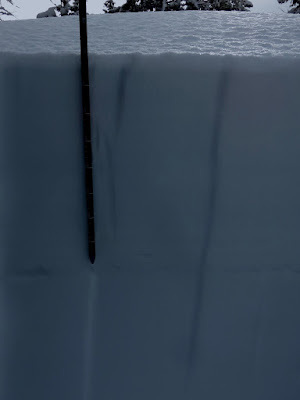 The surface hoar currently buried at 40 cm is very concerning. This surface hoar weak layer is likely to be widespread based on our observations for Mores Creek Summit, as well as Banner Summit. New snow predicted for the next few days will bury this layer deeper in the snowpack, significantly increasing the avalanche consequences, and possibly making slab avalanches unsurvivable even at relatively small slopes. It is also important to remember that slab avalanches with surface hoar weak layers tend to break at shallower angles (28-32 degrees). This is a good time for conservative decisions! The next two picture show the terrain we ski toured last Saturday. The high point is Freeman Peak summit. Freeman Peak views from the East. The terrain we ski toured from Hayfork campground provides spectacular views of the Freeman area. However, it was less than ideal for skiing. 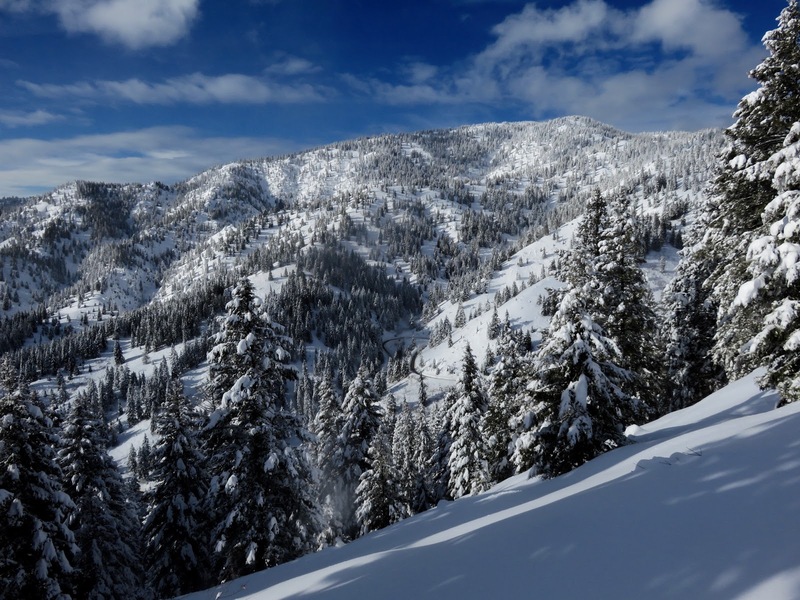 Even with the current snowpack above average, there is still significant brush from 5000 to 5600 feet elevation, and the tree forest tend to be denser that the nearby Freeman and Pilot Peak areas. Sunset West Ridge - Having lunch at a saddle above 6000 feet.